since relocating from little rock to austin, my brain has been on overload. after this summer’s voyage through the west, i thought i would have time to digest all that experience and squeeze out loads of concepts and art. but it’s like a big mental constipated mess … only with colorful imagination instead of, well, poop. about a year ago, living in little rock, i decided to stay through winter and spring, go to peru in the summer of 2010, then move to austin by the end of summer. it is a transition i had contemplated for some time to push my boundaries, but the timing had always been off. moving seemed scary and difficult … so naturally, it was attractive. through self-motivation (and a little rejection & humiliation, of course), i had built up a strong professional career in art and design in little rock and was widely accepted. it was more than i could ask for. when you relax in your own shoes, they fit so much better. when the time came to follow through with my plan, it was at an incredible juncture – the title of arkansas times “2010 best arkansas artist” was awarded to me, and i was blown away. it fueled me to push forward with the move, knowing i had the support of home. it has taken a month or two to settle and find a place for living and creating in austin. but it’s been found. 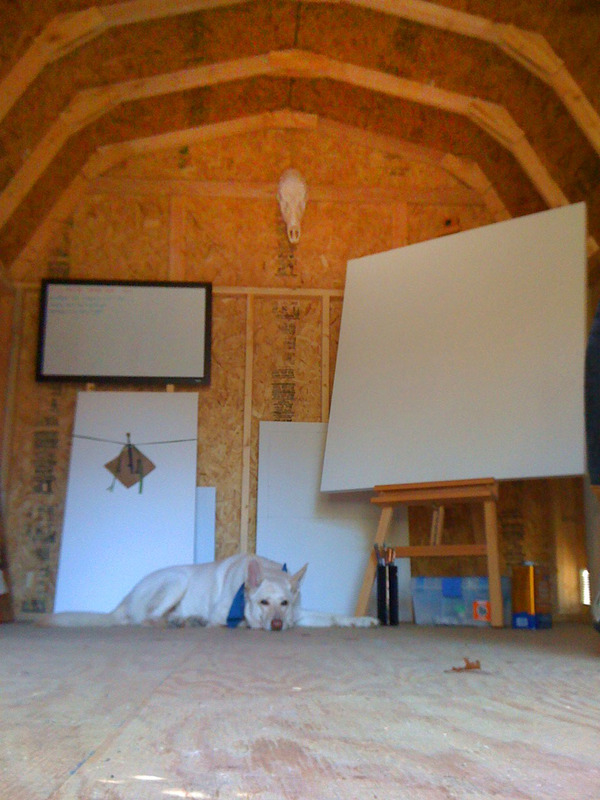 the little workspace is rugged and perfect and the community is creative and driven. after sharing studio space with my mother or brother, working out of the bedroom, the kitchen, the bathroom, the yard, i now have a place to call my own. to step out of the everyday and dive in. i am very thankful for the little barn. the good news for you guys is that i’ll be posting new work soon and you won’t have to read my rambling tangents as often! you’ll just get to see that energy used on art. and i can’t wait. God bless difficult changes, for bright and shiny ones are soon to follow.